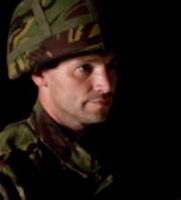 Will Filing for Bankruptcy Hurt My Chances of Serving in the Military? The U.S. military is choosy who it allows to enlist. Many people are aware that they need to meet certain physical requirements before they can join the military, but fewer are aware that their finances will come under scrutiny as well. One option for dealing with a crushing debt load is to file for bankruptcy. But will doing so impact your ability to enlist? There is a sensible reason that the military will look at your credit history before deciding whether to admit you. In short, the government cannot have anyone who is a security risk serving in the military because this person could be easily compromised. Imagine if you were $100,000 in debt but had a security clearance that gave you access to sensitive information. Wouldn’t you be at risk of accepting a bribe from a foreign power in exchange for turning over the information? The military also wants to make sure that you can make your debt payments on your anticipated military salary. If you can’t, then they will probably not allow you to enlist. There is no bright line rule that filing for bankruptcy will make you ineligible for military service. However, everything really depends on your reasons for filing. For example, someone who files because they incurred large amounts of medical debt after an illness or injury looks different than someone who filed because they spent too much on luxury purchases. Generally, the military will view a bankruptcy more favorably if the circumstances that led to it were outside your control. In those cases, filing for bankruptcy can look like a responsible decision to get debts under control. To understand how debt will affect your chances of enlisting, speak to a military recruiter. They have met with all kinds of people who have suffered financial trouble, so don’t be too embarrassed to raise this issue. The recruiter might also have practical tips for helping you get your debt load under control and might even recommend bankruptcy. If filing for bankruptcy is the right decision for you, we can help with the process. The bankruptcy team at Nowack & Olson is made up of seasoned legal professionals who have helped thousands of people Plantation and around South Florida manage their financial difficulties. We have experience with both Chapter 7 and Chapter 13 bankruptcies, and we can discuss how either will affect you. Reach out to us today. You can schedule time for a free consultation by calling 888-813-4737 or sending us a message.